Ten years to avert climate catastrophe? What do we do now? Today is a good day – a very good day – to be praying and speaking about the natural world. This week the U.N.’s Intergovernmental Panel on Climate Change released a major report about what it will take to keep the earth’s temperature below 1.5 degree Celsius of warming. That’s the level that countries around the world have agreed is a reasonably safe upper limit for maintaining life as we know it on this planet. As one reporter puts it, holding warming to that level would most likely avert “catastrophic climate change like the collapse of rain forests and coral reefs, rapid melting of the ice sheets that would swamp coastal cities around the world and heat extremes that could lead to millions of climate refugees.” The U.N. report makes it clear that to stay within that 1.5 degree boundary of safety, or even within 2 degrees of warming, will require an extraordinary collective effort by human beings worldwide. The only way to avoid hurtling past that threshold is to carry out a “rapid and far-reaching” transformation of human civilization at a magnitude that has never happened before. Such a radical transformation of society has what the report calls “no documented historic precedent,” yet it must be carried out breathtakingly fast: the world has perhaps just over ten years in which to prevent climate catastrophe. Wouldn’t you know – at the same time that the Intergovernmental Panel on Climate Change issued its report, a monster storm was forming off the Gulf Coast. It quickly grew to a Category 4 hurricane with sustained winds of 155 miles per hour, careened into the Florida Panhandle and then roared across the Carolinas, leaving devastation in its wake. Our hearts go out to the people who lost their lives, homes, and livelihoods to Hurricane Michael, which was supercharged by warming seas, exactly the kind of extreme weather event that is linked to climate change. I know we have a lot on our mind these days. In these turbulent times, many concerns are pressing for our attention. But tackling climate change must be front and center if we are going to leave our children and grandchildren a habitable world. Can we do it? Just as important: will we do it? Given the enormity of the task, I know it’s easy to feel helpless and overwhelmed, easy to shut down, throw up our hands and call it quits. “It’s too late,” we tell ourselves. “What difference can I make? It’s not my problem. Someone else will have to deal with it. Besides, the world is cooked. We’re done for. I might as well put my head down, go shopping, grab a beer.” It’s easy to collapse into fatalism or despair. I assume that strictly speaking all of us in this room are not climate skeptics – we do respect climate science, we do understand that burning fossil fuels is disrupting the global climate and threatening the whole human enterprise – but most of us engage in a kind of everyday climate denial: we don’t want to talk about it, we don’t want to think about it, we don’t know what to do about it, and we surely don’t want to feel the emotions that this crisis evokes. That is why I give thanks that I’m here with you this morning. 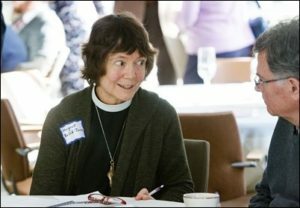 When we face the stark reality of climate change and grasp that we have perhaps ten years in which to avoid irreversibly dismantling the life systems of the planet, we need to find each other – we need to gather with other people of faith and good will, to see each other’s faces, look into each other’s eyes, and feel each other’s hands in ours. And we need to pray. Taking action is essential, but in order to discover what we are called to do – and to find the strength to do it – we need to pray, to open ourselves to a power and wisdom that is greater than our own. My friends, we need help. We need guidance. We need the love and power of God. And so we pray, recognizing, as Terry Tempest Williams says in our first reading, “that we exist by the grace of something beyond ourselves.” Our prayer can take many forms, as Terry also acknowledges. In times like these, our prayer may need to be expressive and embodied, visceral and vocal. How shall we pray with our immense anger and grief? How do we pray about ecocide, about the death that humanity is unleashing upon Mother Earth – and upon ourselves? 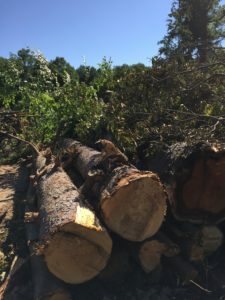 Over the past few weeks a company has been cutting down trees in the woods behind our house, clearing space for a new co-housing development. I’m all for co-housing, and I’ve met some nice people who plan to live there, but, honestly, I grieve the trees. So I’ve taken to praying outdoors. I go outside, feel my feet on the good earth, feel the wind on my face, and I sing to the trees. I sing my grief to the trees that are going down, and my grief about so much more: about what we have lost and are losing and are likely to lose, making up the words and the music as I go along. I sing my rage about these beautiful old trees going down and about the predicament we’re in as a species, my protest of the political and corporate powers-that-be that drive forward relentlessly with business as usual, cutting down forests, drilling for more oil and fracked gas, digging for more coal, expanding pipeline construction, and opening up public lands and waters to endless exploitation, as if the Earth were their private business and they were conducting a liquidation sale. I sing out my shame to the trees, my repentance and apology for the part I have played in Earth’s destruction. I sing out my thanks, my praise for the beauty of trees and my resolve not to let a day go by that I don’t celebrate the preciousness of the living world of which we are so blessedly a part. Our prayer may be noisy and expressive, or it may be very quiet, the kind of prayer that depends on listening in stillness and silence with complete attention: listening to the crickets as they pulse at night, listening to the rain as it falls, listening to our breath as we breathe God in and breathe God out, listening to the inner voice of love that is always sounding in our heart. I imagine that Jesus prayed like that, both expressively and in silence, and more often than not outdoors. 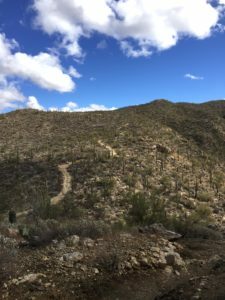 That’s where we usually find him in the Gospel stories – outdoors in the wilderness, on a mountain, beside the sea, or walking mile upon mile down dusty roads. Jesus was immersed in the natural world and he used images of nature in his parables and teachings: weeds and wheat; seeds and rocks; lilies, sheep, and sparrows. No doubt he knew from his prayer, as we know from ours, that when we pray in the company of the living world, when we pray “with the Sacred, with God and each other,” we receive strength from beyond ourselves. That’s why I chose the second reading: as Matthew’s Gospel tells it, Jesus passes along the Sea of Galilee and then goes up the mountain. I wonder if his being with the sea and with the mountain, and his prayerful walking in fresh air, were part of his communion with the divine. For it is from out of his immersion in the natural world that Jesus begins to carry out actions that bring healing and wholeness. His prayer is transformed into action; his secret communion with the God of love spills over into acts of love, and through his presence, words, and touch, great crowds of people are healed. 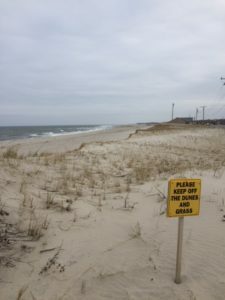 Does something like that happen when we, too, pray with and for the natural world? Despite its wounds, the living world still conveys the mystery of the living God. Like Jesus, when we experience the divine presence, we receive fresh energy to renew the face of the Earth, to become healers and justice-seekers. We cast our lot with people of faith and spirit who have been awakened – as we have been awakened – by a fierce longing to join the dance of life. We rise up from prayer to act, and we pray as we act. What does it look like when we join God’s dance of life? We start by making personal changes. Maybe we cut back strongly on our use of fossil fuels and switch to clean sources of energy. (After today’s service, you have an opportunity to switch to wind power as the source of your home’s electricity.) Maybe we fly less, drive less, and eat less meat. Shifting to a plant-based diet turns out to be one of the most climate-friendly things we can do. And we also push for the larger, systemic changes that must be carried out by businesses, politicians and non-profits. Maybe we lobby for policies that support renewable energy, carbon pricing, and clean green jobs. 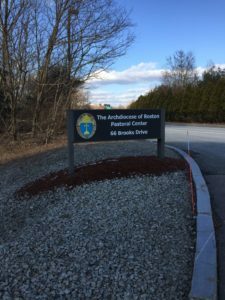 Maybe we sign up with 350Mass. 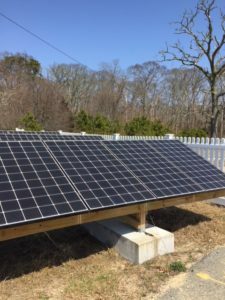 for a Better Future, the grassroots climate action group in Massachusetts that is fighting for a rapid and just transition to 100% renewable energy. 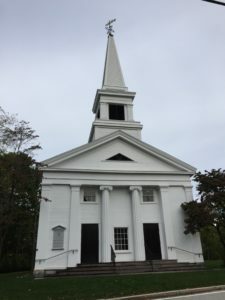 350Mass has a local node that includes people right here in the town of Lincoln. What else can we do? We can vote for candidates with strong climate policies, and maybe send some money to climate champions running for office in other states. If we went to college, we can push our alma mater to divest from fossil fuels. 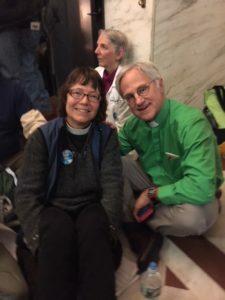 Some of us may feel called to join the growing numbers of faith-filled people who carry out peaceful civil disobedience and put our bodies on the line. In whatever ways we step out to heal God’s creation and to join the dance of life, we will take risks we never imagined we would take. We will connect with people we never imagined we would meet. And we will make more of a difference than we will ever know. Will we succeed in creating a more just and gentle relationship between humanity and the rest of Creation? 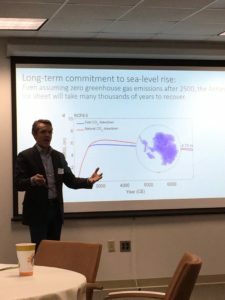 Will we succeed in averting climate disaster? I don’t know. But I do know this: I intend to bear witness to the power of a living God until the day I die, and I know that you do, too. Thank you for your courage and your faithfulness. I look forward to hearing what next steps this community will take. 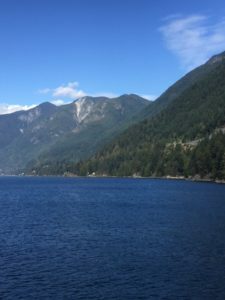 Friends, I feel blessed to be back in Vancouver, to see the mountains again and to ride a bike with my husband around Stanley Park. On our first day we took a boat trip out into the ocean, where we sighted humpback whales the size of a bus, lingering on the surface of the water, rolling, splashing and breaching in the waves. 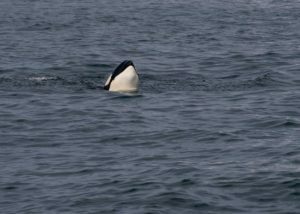 We also encountered a pod of transient orcas, which, as you know, are endangered. 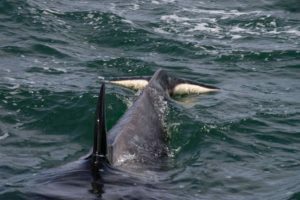 One of the orcas rose up out of the water to take a look at our boat, and, to our amazement, it and a second orca swam toward us very slowly and deliberately, right up to the side of the vessel. 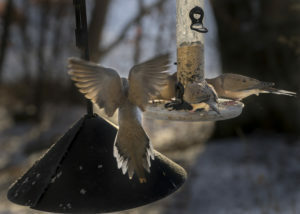 At the last moment they dove underneath, emerging a little distance behind us. It felt like a greeting, like a blessing, and some of us gasped with astonishment, some of us cheered and some of us were moved to tears. So before I do anything else I want to pass it on to you, that greeting and blessing from our orca kin, as we gather this morning to praise God. The voice of God is speaking in our midst and in our depths, and it sings out clearly in our first reading, “Arise, my love, my fair one, and come away” (Song of Solomon 2:10). I need to hear that voice. I need to dwell in its presence, for honestly, I came to this city with a heavy heart. 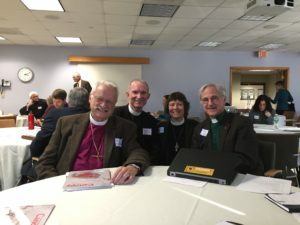 Back in the United States, I serve as Missioner for Creation Care for the Episcopal Diocese of Western Massachusetts and for the United Church of Christ across the state. 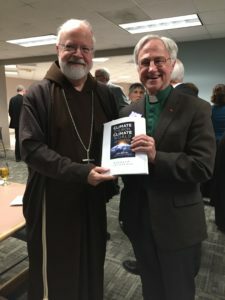 In this ecumenical role, I travel from place to place, preaching, speaking and leading retreats about the sacredness of God’s Creation and our call to protect the web of life entrusted to our care – especially the urgency of addressing climate change. 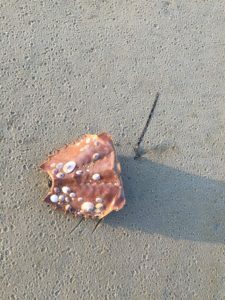 (If you want to see what I’m up to, please visit my Website, RevivingCreation.org, for articles and blog posts.) I love my job, but it’s tough these days to pay attention to what’s happening to Mother Earth and our fellow creatures, to our oceans, forests, and waterways, to the very air we breathe. My heart goes out to all of you who, a week or two ago, were choking on smoke from nearly 600 forest fires on the west coast, and facing an air quality advisory across most of the province that warned you not to breathe in the fine particulates. As I left Massachusetts, smoke from the fires raging here in the Pacific Northwest was causing a visible haze over New England. 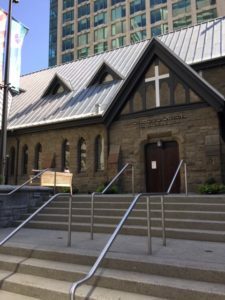 What’s happening in Vancouver connects with what’s happening all over the world. Climate change caused by burning fossil fuels is raising temperatures, making heat waves more intense and more frequent, drying out soil and trees, and making wildfires spread. This summer, record-breaking temperatures gripped the globe from Japan to Algeria, from Canada to Greece. The global heat wave even set the Arctic Circle on fire. This year is on pace to be among the four hottest years on record, the other three being 2015, 2016, and 2017. Despite these accelerating signs of distress, and with more scorching heat to come if we don’t change course fast, the powers-that-be relentlessly drive forward with business as usual, drilling for more oil, pushing to expand pipeline construction, cutting down forests, and generally acting as if the Earth were a private business and they were conducting a liquidation sale. I don’t know about you, but I know what it’s like to feel alarm, anger, sorrow, and even despair. As a species we are hurtling willy-nilly down a suicidal path that risks bringing down not only our own civilization but also the web of life as it has evolved for millennia. That is why I am moved to hear those words from the Song of Solomon (also known as the “Song of Songs”), moved to hear God say to us: “Arise, my love, my fair one, and come away.” You probably recognize this passage as one that’s often read at weddings. The Song of Songs is a collection of sensual poems between two lovers who delight in each other and who long to consummate their desire, and it turns out that Christian mystics wrote about the Song of Songs more extensively than they did about any other book in the Bible, interpreting these poems as a passionate conversation between God and the soul. In a precarious time – when many of us feel unsettled about the present and worried about the future, when many of us may feel anxious and alone, overwhelmed by challenges in our personal lives and doubtful that we can make a difference in the world around us – it is powerful to remember that God is a lover who is always reaching out to us, always speaking in our depths, always luring us to stay in relationship with each other and with God. For here is God, reaching out a hand to pull us into the dance of life. That’s one way of understanding the Holy Trinity: as a dance of love between the lover, the beloved, and the love that flows between (Augustine). “Come on in,” says God, “and join the dance!” “Arise, my love,” God says to our soul. “Arise, my fair one, and come away.” The inner voice of love is quiet. We can hardly hear it amidst the roar and bustle of the world. We can hardly sense it when we’re gripped by depression, anxiety, or alarm. That’s why many of us reclaim a practice of prayer: we know we will hear the inner voice of love only if we practice stillness, only if we set aside some time in solitude each day to steady our minds and to listen in silence for the love that God is always pouring into our hearts (Romans 5:5). 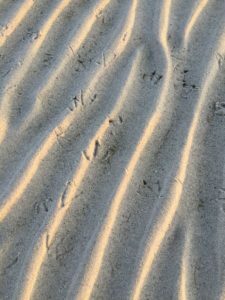 As our minds grow quiet and as our stillness grows, a holy Someone – capital S – beckons to us in the silence: “Arise, my love, my fair one, and come away.” It’s the voice of Jesus, the voice of Spirit, the voice of God. “Arise, my love.” From what do you need to arise? Maybe the Spirit is saying: Arise from apathy, numbness, and fear. Arise from the agitation that holds you in its grip. Arise from hopelessness, for I will give you strength. Arise from loneliness, for I am with you, and I love you. You are my love, says the Spirit. You are my fair one. I see your beauty and you are precious in my sight. Arise and come away – away from the cult of death, away from the path of destruction, away from the lie that your efforts to protect life are useless. Come with me and join in the dance of life. I will help you find your place in the great struggle to protect life and to build a more just society. “But,” we may protest, feeling helpless before the horrors of the world, helpless before its injustice and needless suffering. “Who am I? I have no power. I am so very small.” Arise. “What can I do? What can anyone do? It is too late to make a difference!” Arise. “I don’t have time. I don’t have energy. I’ve got other things to do.” Arise. The voice of love is like that, right? It may be gentle, but it is persistent. It may be subtle, but it will never die. The love that created the universe, the love that stirs in our depths, the love that is being poured into our hearts – that holy love will never let us go, and it sends us out into the world to become beacons of light, and warriors for truth, and protectors of life. I may have a thousand and one reasons to dodge love’s call, but then it comes again, that voice: Arise. I love you. I need you. I am calling from the trees, from the wind, from the very stones beneath your feet. I am calling from the orcas and the salmon, from the black bear and the mountains, from the fig trees and the vines. I am calling from the strangers who are not really strangers, but brothers and sisters you don’t yet recognize, those who are suffering right now from a wounded Earth and a changing climate. I am calling from the future, from the men, women and children who will inhabit this planet long after you are gone and who depend on you to leave them a habitable world. Arise, my love, my fair one, and come away. 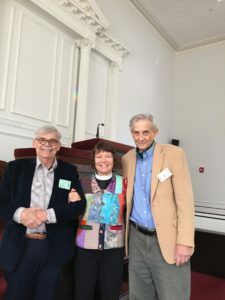 Margaret contributed to a collection of essays, “The Episcopal Church — standing up to climate change denial?”, assembled by Margaret Daly Denton and published in SEARCH: A Church of Ireland Journal, Spring 2018. The other contributors are Presiding Bishop Michael B. Curry, the Rev. Fletcher Harper (GreenFaith), and Nathan Empsall (Yale Divinity School seminarian). To download the essay, click on the title: TEC Standing up to Climate Change Denial. The Website for SEARCH: A Church of Ireland Journal is here. It’s clear that Jesus’ baptism was a decisive experience, a pivotal event that launched him into his public ministry. The story is told in all four Gospels, and it’s the very first story about Jesus that we hear in the earliest Gospel, the Gospel of Mark. In his baptism, Jesus consciously received the identity that had been his since before the beginning of time: he was, and had always been, the child of God, the beloved of God, and nothing and no one could take that love away. That’s what happens in our baptism, too: like Jesus, we, too, are forever claimed as God’s own. From that moment and for the rest of our lives, we are drawn into the life of God, caught up in an unbreakable relationship of love. Do you ever wonder who you are, who you really are, deep down? Today’s Gospel story gives the answer. Without doing a thing to deserve it or to earn it, you are the son, you are the daughter, you are the beloved of God – you are the one with whom God is well pleased. Wherever you go, whatever you do, wherever the Spirit sends you, the divine life is flowing through you, as close as your breath, as close as your heartbeat. You and I belong to Christ forever, and we are loved to the core. I don’t know about you, but I find this a deeply consoling truth to hold on to right now, when so many people feel stressed and scattered, anxious or depressed. We live in a turbulent time, and the world is rapidly changing. Sometimes it seems that everything is falling apart, so it’s easy to feel unmoored, ungrounded, and afraid. What a perfect moment to remind ourselves of our baptism and to touch in again to the deep truth that we are God’s beloved daughter or son, and that nothing can separate us from the love of God (Roman 8:35-39)! Here’s the thing: the love that embraced us in our baptism, the love that flows through us with our every breath – that love extends not only to individuals, not only to the baptized, and not only to human beings. The love of God embraces the whole Creation. Scripture tells us so (e.g. Gen. 1:31; Gen. 9:8-10, 15; Psalm 19:1; Psalm 24:1; John 3:16; Romans 1:20; Ephesians 1:10, Ephesians 4:9-10, Col. 1:19-20), and we glimpse this truth in our own experience. Anyone who has ever been amazed by the beauty of the world – anyone who has ever spent time studying the details of a single leaf, or gazing at a mountain, or looking at the stars on a frosty night knows what it’s like to feel a wave of wonder, humility, gratefulness and awe. The Creator of all-that-is is always disclosing God’s self to us in the natural world, always inviting us to slow down, look carefully, and greet our other-than-human kin. That’s what Jesus did, I think: he lived close to the Earth, and in the Gospels we often find him outdoors, praying in the desert, walking along a seashore, or climbing a mountain. Here he is in today’s story, plunging into a river! His parables and stories are rich with images of nature: sheep and seeds, lilies and sparrows, weeds and rocks. As I consider Jesus, it seems to me that he encountered every person and creature he met with eyes of discerning love. He saw the inherent sacredness of the created world because he saw with his sacred eyes. He knew that we belong to a living, sacred whole and that everything is lit up with God, because he himself was lit up with God. Jesus knew what poet Gerard Manley Hopkins proclaims: “The world is charged with the grandeur of God.” So when we see that living world being desecrated – when we see God’s good Earth being poisoned by toxins and pollutants, and laid waste by corporate greed – when we realize that the web of life is unraveling before our eyes and learn from scientists that a mass extinction event is now underway, a “biological annihilation”– when we understand that burning coal, gas, and oil is pushing the planet to break new records for heat, causing droughts, floods, and monster hurricanes, drowning cities, and accelerating wildfires – when we realize that, unless we change course fast, we will not leave our children and our children’s children a habitable world – then we are moved to take action. For we want to bear witness to the love of Jesus; we want to honor the glory of God’s Creation and to protect it from further harm. 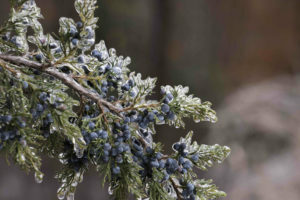 I wish I could tell you, as some highly placed but misinformed politicians have recently claimed, that the bitter cold that has gripped North America and the hurricane-force winds that just blasted the East Coast are a sign that global warming is not real. In fact, researchers point out that climate change may well be related to these frigid temperatures: the Arctic is warming rapidly, and the jet stream that once functioned like a strong fence or lasso that held cold air firmly around the pole now seems to be giving way and growing weak. Some scientists compare it “to leaving a refrigerator door open, with cold air flooding the kitchen even as warm air enters the refrigerator.” In any case, except for Canada and the northern United States, just about every other part of the world is warmer than normal. Last year was the second hottest on record for our planet as a whole, just behind a sweltering 2016, which crushed the record set the year before, which in turn crushed the record set the year before that. Sixteen of the seventeen hottest years have all been in this century. Thank God, there is a lot that we, as individuals, can do. Maybe we can plant a tree. Save a tree. Recycle more. Drive less. Eat local, and move to a plant-based diet. Get our home insulated and get LED lighting. Support local farms and land trusts. Fly less – and, if we must fly, buy carbon offsets. Maybe we can afford solar panels and move toward a carbon-neutral home. You know the drill! Individual changes make a difference, but because of the scope and speed of the climate crisis, we need more than individual action – we need systemic change. To do that, we’ll need to become politically engaged, to confront the powers-that-be, and to push our elected leaders to awaken from the fantasy that we can continue with business as usual. So some of us carry out peaceful, disciplined actions of civil disobedience to stop construction of new fossil fuel infrastructure and keep fossil fuels in the ground, where they belong. 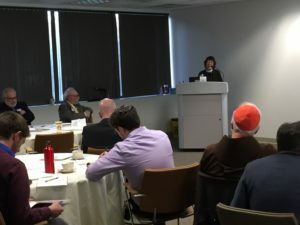 Some of us join Citizens Climate Lobby and push for a national carbon tax, or support legislation right here in Massachusetts that would put a price on carbon. 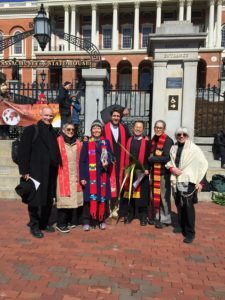 Those of us who are white and privileged listen to the voices of racial minorities, indigenous peoples, and the poor, knowing that they are God’s beloved and that they are the ones hit first and hardest by climate change. Together we intend to build a world in which everyone can thrive. 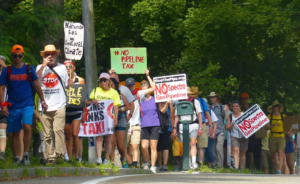 Here in the Berkshires you are fortunate to have a local node of 350Mass for a Better Future, the grassroots, climate action group that is working hard to build political will to stop new pipelines and move the Commonwealth to 100% clean energy. 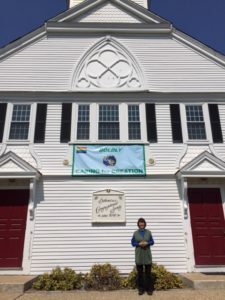 I hope you’ll sign up with 350Mass and check out a local meeting. Our state politicians see what’s needed, but they are not moving fast enough to stop the damage. We who have been baptized into the life, death, and resurrection of Jesus Christ intend to bear witness to our God-given faith that life and not death will have the last word. We intend to become the people that God meant us to be: people who are faithful stewards of God’s Creation, people who are a blessing to Earth and all her communities. Jesus took risks to oppose the unjust authorities of his time, and we must do the same. Here on the first Sunday of the Epiphany we have a chance to make a radical new start. We have a chance to reclaim a covenant more powerful than any stack of New Year’s Resolutions. This morning we celebrate the baptism of Jesus and we affirm the power of our own baptism in His name. We are loved beyond measure by a divine love that will never let us go. Day by day, as long as we live, we have countless opportunities to bear witness to that love. Who knows what compassion will rise up from our renewed commitment, what new cherishing of our selves and each other, what fresh energy for justice seeking and peacemaking in this precious world entrusted to our care? Under threatening skies, a group of men and women gathers in the basement of the Paulist Center, less than a block from the Boston State House. One by one we introduce ourselves and offer a one-word summary of how we feel as we prepare to risk arrest. Everyone has been trained in non-violent civil disobedience. Everyone has taken the necessary practical steps, such as removing wedding bands and other jewelry, slipping a driver’s license or other identification into a pocket, and scribbling the phone number of the jail support person onto an inner arm. In a moment, everyone will select a buddy for the day, for it is good to stand with a friend when you are arrested, handcuffed, put in a police van, and locked in a holding cell. 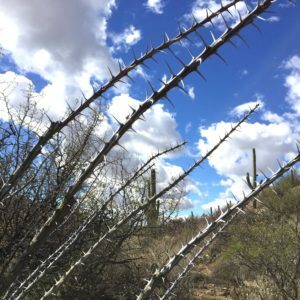 Some of us have faced arrest before, others will risk arrest for the first time, but just now all of us are carrying out a ritual of personal preparation that has been passed down through generations. We are clear about our goals: to leave a just and habitable world to our children. We are clear about our methods: to be non-violent in action, speech, and spirit. We divest ourselves of everything unnecessary. We take with us only what is necessary: a few physical essentials and an open heart. We head out two by two. That’s what Jesus did: he sent out his disciples two by two, ordering them to take nothing for the journey except a staff; no bread, no bag, no money in their belts (Mark 6:7-8). His first followers, the men and women of the Jesus Movement, repeatedly challenged unjust power and were accused of disturbing the peace and “turning the world upside down” (Acts 17:6). These brave souls seemed to spend as much time in jail as they did walking free. At the moment I don’t feel particularly inspired or brave, but that doesn’t matter: I feel called to be here, doing what needs to be done. All around the world, other people are with us in spirit as we gather strength in this Boston basement: they, too, are standing up for what is right, refusing to settle for a death-dealing status quo. 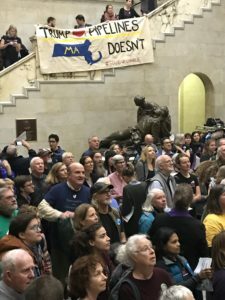 We have our own climate action to take here in Massachusetts. 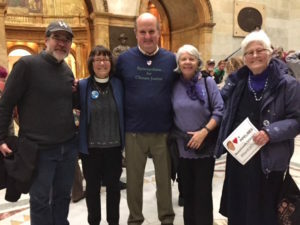 Mass Power Forward, a coalition of environmental, climate, community, and faith groups (including the Social Justice Commission of Episcopal Diocese of Western Massachusetts, and Environmental Ministries of United Church of Christ in Massachusetts) is running a campaign (#StandUpCharlie) to push Governor Charlie Baker to sign an executive order that directs all state agencies to do everything in their legal authority to stop new fossil fuel projects. We want him to speak out against the pipeline tax and make it clear to fossil fuel executives that the Commonwealth is not willing to pay billions of dollars to fund their pipeline projects. We want him to establish a policy of climate justice and to stand up for clean energy, not to perpetuate the lethal grip of fossil fuels. 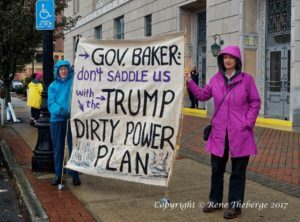 Governor Baker claims that he wants our state to exceed the goals of the Paris Climate Agreement, yet he continues to support the construction of new fracked gas pipelines, power plants, and compressor stations. Does he believe that so-called “natural” gas is a “bridge” fuel that can carry us from coal to clean sources of renewable energy like sun and wind? That’s what industry executives have been touting for years. In reality, fracked gas is a bridge to nowhere. Methane, the primary component of “natural” gas, is a far more potent greenhouse gas in the near term than is carbon dioxide. Investing billions of dollars in new gas pipelines and other fossil fuel infrastructure designed to last for many decades will only delay the urgent transition we need to make to 100% clean energy within the next 20-30 years. What’s more, the supposed fracked gas “shortage” in Massachusetts is only a myth: the Attorney General confirmed in a 2015 study that our Commonwealth does not need more natural gas in order to meet its energy requirements. Keep more fracked gas on the table? That means taking climate stability off the table,1 taking moderate weather off the table, taking intact ice sheets off the table, taking your children’s future off the table, taking a habitable world off the table. Keep all options on the table? No way. Not if you love your children; not if you love the beautiful blue-green planet into which you and I were born; not if you care about climate migrants and refugees; not if you’re concerned about resource wars over clean water and arable land; not if you want to preserve some remnant of the web of life that is fast unraveling before our eyes. 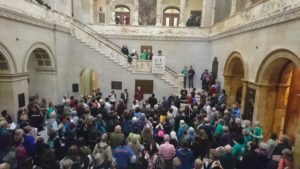 So it’s no wonder – when the twenty-six of us risking arrest have finished initial preparations and walked to the Boston State House, passed through security and assembled with hundreds of supporters in a large hall – that the crowd quickly takes up the chant: “No new pipelines, keep it off the table!” Our cries reverberate against the walls, filling the space. Then up the stairs we go, to the Governor’s Executive Office. 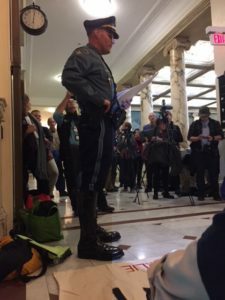 State troopers stand guard at the doorway, preventing us from stepping inside, so the twenty-six of us sit down on the hallway’s marble floor. We intend to sit there until the Governor signs the executive order we seek or until we are forcibly removed. The police back off. Protesters keep a pathway open for pedestrians and wheelchairs, and there in the hallway we stay. Hundreds of supporters, holding banners and signs, spread out nearby. Everyone settles in for a long afternoon. We pass the hours by belting out every inspiring song we know, from “Singing for Our Lives” and “We Shall Not Be Moved” to songs with lyrics written especially for the occasion. We take turns standing up to explain what motivates our activism. A labor organizer speaks of his many years of learning when and how to negotiate. “Sometimes negotiation isn’t possible,” he tells us. “You can’t negotiate with climate change.” Activities that push the world to the brink of climate chaos will never be able to strike a deal with physics and chemistry. A physician in a white lab coat stands up. “In medical school, we learn ‘First, do no harm.’” Policies that cater to fossil fuel companies are doing grave harm to our state, our country, and our planet. I speak about the love that propels me. Climate change is not only a scientific, economic, and political issue, but also one that is deeply spiritual. What do we love most? To what are we willing to commit our lives? What is the North Star that guides our decisions? When we know what we love most, we make energy choices that are wise. And, I might add, we push our elected officials to stop desecrating the Earth entrusted to our care and to move as swiftly as possible to a clean energy future in which all beings can thrive. Many people are with us in body or spirit. A hundred miles west, local activists led by Arise for Social Justice and Climate Action Now are carrying out a simultaneous #StandUpCharlie protest at Governor Baker’s Springfield office. 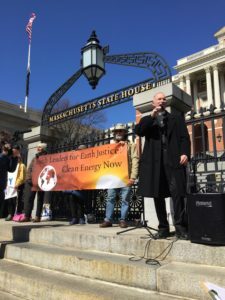 They ask him to meet additional demands that affect climate justice in western Massachusetts: to prevent large-biomass burning, to expand our system of public transportation, and to implement East-West high-speed rail. The hour is late. The building will close at 6:00 p.m. Additional police officers assemble nearby. After brief, intense discussions among ourselves, we decide that we are willing to face criminal charges and to be summoned to court without undergoing arrest – a decision that some of us regret (see Wen Stephenson’s subsequent article in The Nation). A police officer announces the charges – trespassing and unlawful assembly – and we hand over our driver’s licenses to be photocopied. We head out into the night. 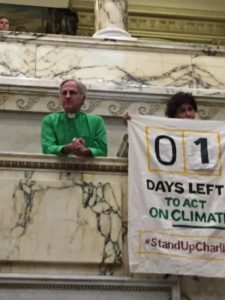 The #StandUpCharlie campaign plans a brief hiatus, to give the Governor some time over the holidays to consider his leadership on climate. 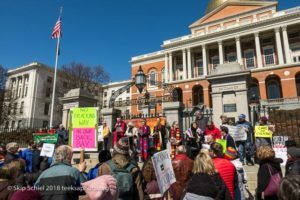 In January, we intend to come back, and in greater numbers, until the Governor agrees to take a clear stand against more fracked gas projects in Massachusetts. Preserving a habitable planet depends on local and regional action by every sector of society, especially when our national government seems determined to dig us ever deeper into the pit of relying on fossil fuels. Whatever form our actions take – whether or not they include arrest – we will need to be loving, bold, relentless, and strong. And persistent. Jesus encourages persistence in prayer. He encourages his friends “to pray always and not to lose heart” (Luke 18:1). Then he tells a parable about a persistent widow who refuses to quit pestering a judge until he grants her justice (Luke 18:1-8). Fed up by her tenacity, the judge at last relents, saying, “Because this widow keeps bothering me, I will grant her justice, so that she may not wear me out by continually coming” (Luke 18:5). A point made by climate activists Kathleen Wolf and Craig Altemose.